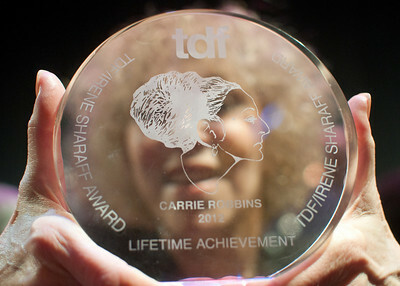 Carrie Robbins holds the 2012 TDF/Irene Sharaff Award given her for lifetime achievement in costume design. She has worked on more than 30 Broadway productions and got Tony Award nominations for "Grease" in 1972 and "Over Here!" in 1974. 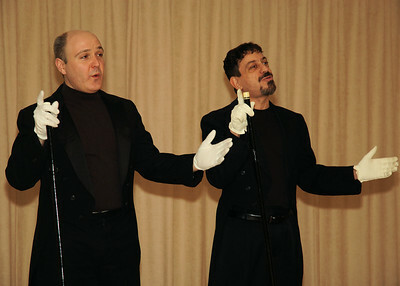 Scenery, costume and lighting designer Lloyd Burlingame, right, received the 2012 Robert L. B. Tobin Award from the Tobin Theater Arts Foundation. 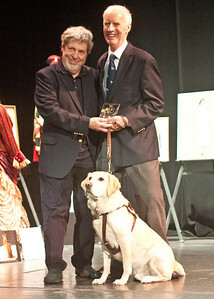 He and his guide dog Kemp are with the presenter, English set and costume designer Tony Walton, on stage at the Hudson Theater in Manhattan. Burlingame was in his 60s and teaching grad students at New York University when he went blind. Actor Chris Pine talking about his starring role as Robert the Bruce in "Outlaw King," a 2018 Netflix film about the 14th Century rebellion against English occupation in Scotland. 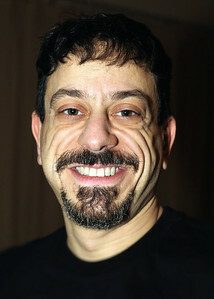 His appearance followed a Manhattan screening of the bio-epic. 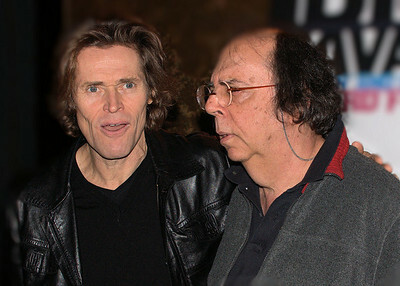 Actor Willem Dafoe and playwright/director Richard Foreman. They endured a photo op at the cast party following the November, 2009, debut of Foreman's absurdist drama "Idiot Savant" at New York's Public Theater. Dafoe starred in the piece. 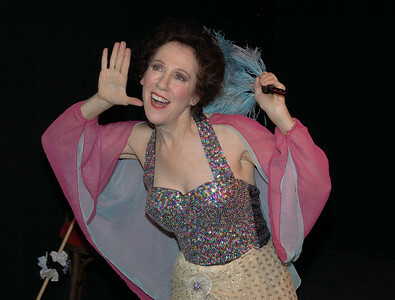 The singer recreated four turn-of-the-century vaudeville performers in her one-woman show, "Good Bye, My Lady Love." 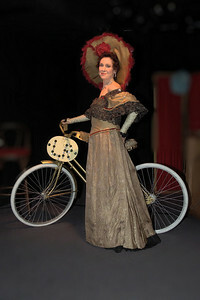 You see her here as Lillian Russell in the opening number. In layers under this gown are outfits of Blanche Ring and Eva Tanguay, into whom Sally transformed herself with quick-changes while chatting to the audience from behind a dressing screen. 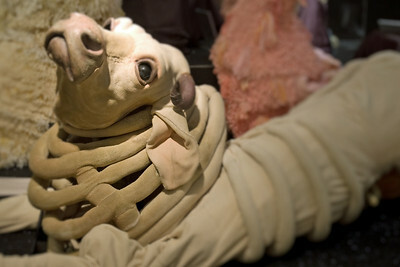 The costumes were created by Jennifer Grambs for the 1999 premier at the Shooting Star Theater in New York's South Street Seaport. 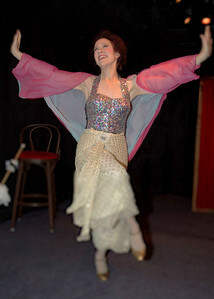 Singer Sally Sherwood as Anna Held, one of four turn-of-the-century vaudeville performers she recreates in her show, "Good Bye, My Lady Love." It premiered in 1999 at the Shooting Star Theater in New York's South Street Seaport. 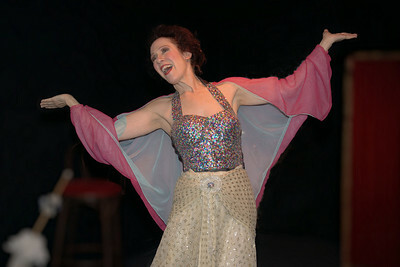 Singer Sally Sherwood as Anna Held, one of four women vaudevillians she portrays in her show, "Good Bye, My Lady Love." 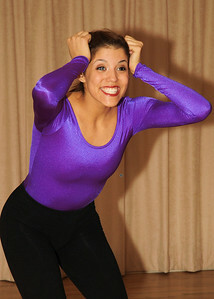 The musical premiered at New York's Shooting Star Theater in 1999. 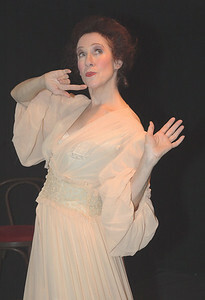 Singer Sally Sherwood as Eva Tanguay, one of four turn-of-the-century vaudeville performers she recreates in her one-woman show, "Good Bye, My Lady Love." It opened in 1999 at New York's Shooting Star Theater. 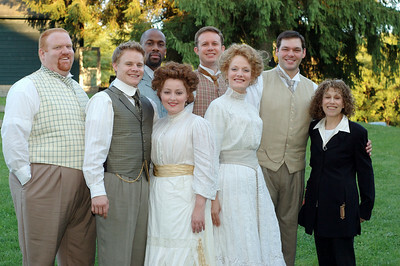 Cast members of a 2005 production of Benjamin Britten's "Death in Venice." 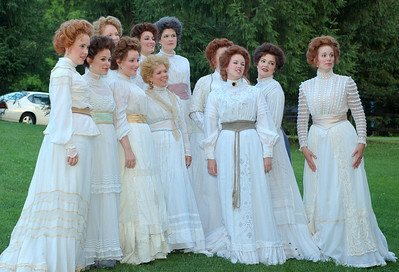 The costumes were done by Broadway designer Carrie Robbins for a staging at the Glimmerglass Opera in Cooperstown, New York. Broadway designer Carrie Robbins, at right, with cast of Benjamin Britten opera, "Death in Venice," for which she did the costumes. The production took place in 2005 at the Glimmerglass Opera in Cooperstown, NY. 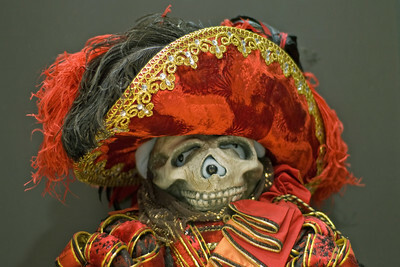 Based on a character called Red Death in Phantom of the Opera, it is one of the Broadway Bears that are custom-designed and made to be auctioned at annual fundraisers for Broadway Cares/Equity Fights AIDS. One of a number auctioned each year to raise money for Broadway Cares/Equity Fights AIDS. This one is based on the scheming orphanage director, Miss Hannigan, in "Annie." 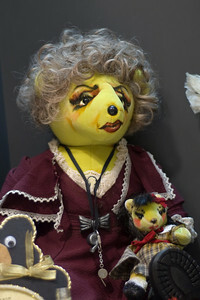 It was displayed at "Curtain Call" exhibit of work by women theatrical designers, held at New York's Lincoln Center in 2009. 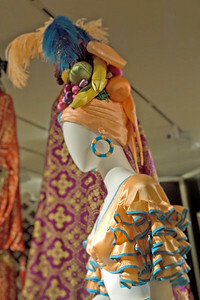 It took three hardy women to lift this 80-pound costume onto the mannequin for the "Curtain Call" theatrical design exhibit at New York's Lincoln Center in 2009. And it came with four pages of instructions. 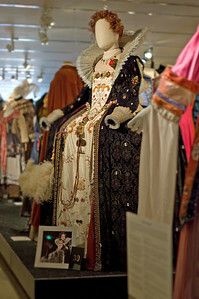 The costume was designed by Linda Cho and based on Hilliard's famous portrait of Queen Elizabeth I. The costume was worn by a man in "Passion Play," done at Arena Stage in Washington, DC. Milky White, the cow, was designed by Susan Hilferty for the musical "Into the Woods." 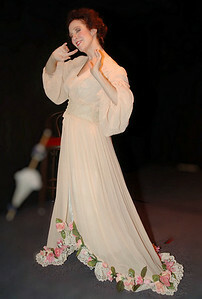 It was made by four sculpting experts and was on view in the 2009 "Curtain Call" exhibit at New York's Lincoln Center. Inspired by Brazilian singer Carmen Miranda, this headdress and top were designed by Judy Dearing for the Broadway musical "Swinging on a Star." 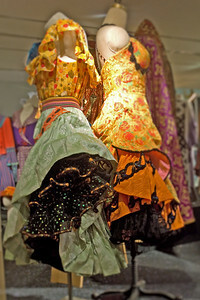 It was among the costumes chosen for the "Curtain Call" exhibit at New York's Lincoln Center in 2009. 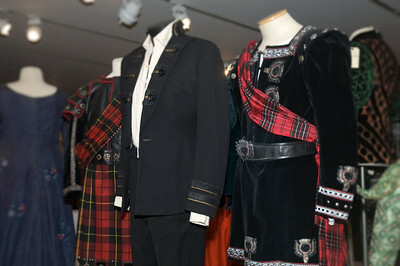 The costumes with plaid trimmings are from the Macbeth scene of a Broadway production, "Two Shakespearean Actors," in which both performers did scenes from various plays by The Bard. At center is a wool jacket and pants worn by Maurice Evans in a modern-dress production of "Hamlet." All were part of the 2009 "Curtain Call" exhibit at New York's Lincoln Center of theatrical costume, set and lighting design by women. Patty Lockery and Lars Rosager rehearse the "Begin the Beguine" tap number for the "Gotta Dance" concert by NYC's Dance Makers.